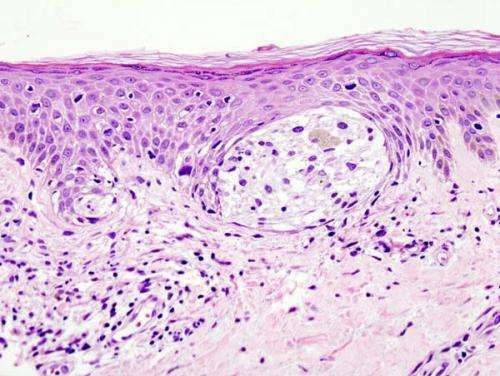 Changes in the structure of the skin and the lymphatic system that occur with the natural aging process create permissive conditions for melanoma metastasis, according to two studies by The Wistar Institute. These changes are caused by loss of the HAPLN1 protein, which is part of the extracellular matrix, during aging. The studies were published back-to-back in Cancer Discovery. Older age is a negative prognostic factor for melanoma, associated with higher frequency of development of incurable distant metastasis. Ashani Weeraratna, Ph.D., Ira Brind Professor, and professor and co-leader of the Immunology, Microenvironment and Metastasis Program at Wistar, and team have a long-standing focus on how aging affects the melanoma microenvironment, or the tumor's ecosystem that includes immune cells, fibroblasts, blood and lymphatic vessels, and signaling molecules, to understand how age-related changes contribute to tumor progression and therapy resistance. In these new studies, the Weeraratna Lab and collaborators characterized architectural changes that occur in the extracellular matrix (ECM) in the skin and surrounding the lymphatic vessels, which promote the spread of melanoma cells to distant sites by influencing tumor cell and immune cell trafficking. They also discovered a fundamental role played by the HAPLN1 protein in the molecular mechanisms underlying these changes. "The same structural changes that happen in our skin with aging and cause the appearance of wrinkles are also responsible for the increased risk of metastasis in older melanoma patients," said Weeraratna, senior author in both studies. "With advancing age, the network of fibers that supports our skin loses the 'basket weave' organization that is characteristic of younger skin, and becomes looser. In a tumor setting, we think of it as a barrier that helps contain the tumor cells by inhibiting their motility while favoring infiltration of immune cells into the tumor mass. In older patients, due to the loss of HAPLN1, this barrier becomes less efficient." By manipulating expression levels of HAPLN1 in three-dimensional human skin reconstruct models and in mouse skin models, Weeraratna and colleagues showed that loss of HAPLN1 creates a permissive microenvironment that favors escape of tumor cells while hampering trafficking of antitumor immune cells, particularly CD8+ T cells. Accordingly, injection of recombinant HAPLN1 around the tumor in melanoma mouse models reduced the size and metastatic capability of the tumor. In the second study, Weeraratna and colleagues showed that age-associated loss of lymphatic vessel integrity allows melanoma cells to escape more easily the lymphatic system and the proximal lymph nodes to reach distant sites. Results showed that this process, too, is associated with loss of HAPLN1, which causes a similar scenario to that described in the skin: degradation of the extracellular matrix in which the lymphatic vessels are embedded and reduced anchorage of lymphatic endothelial cells to their structural support, which results in increased permeability. "It is known that older individuals with melanoma have a lower incidence of lymphatic metastasis than younger patients yet higher rates of distant visceral metastasis," said Weeraratna. "Our observation that older lymphatic vessels and lymph nodes are less efficient as a barrier to contain the metastatic cells may underlie that observation."